Can a Felon Become a Surveyor? There are resources available for felons looking for a job. Often it takes learning a new trade or starting a different career to demonstrate that felons make good employees. For those with experience in land development, becoming a surveyor is a possibility. 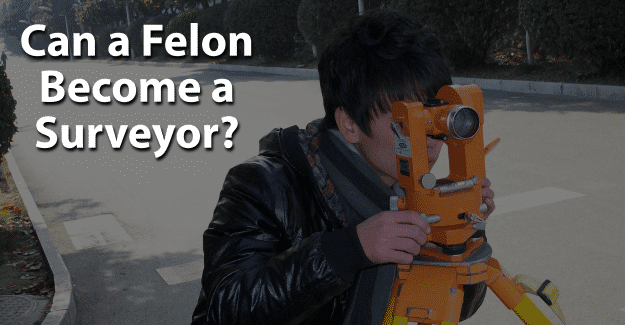 This blog post will address the issue of whether or not a felon can become a surveyor. What is Required to Become a Surveyor? How Much Does a Surveyor Earn? A surveyor is a certified professional who is responsible for determining boundaries of land, air space, and water. There are a number of traditional tools that a surveyor uses routinely, including a level and a transit for measuring vertical and horizontal angles and distances. More technological equipment involves using a global positioning system (GPS) to locate reference points precisely. A surveyor also uses a geographic information system (GIS). This technology allows surveyors to represent spatial information as maps and charts. To succeed as a surveyor, someone must be able to record data accurately and envision distance in size to describe physical objects as landmarks on a map. A surveyor typically needs a bachelor’s degree and must be licensed. Becoming licensed usually requires approximately four years of work experience and training with a licensed surveyor after completing a bachelor’s degree. While working as a novice (journeyman) surveyor, someone is called a chainman and utilizes tools typical for a forester to clear land for measuring. Because of the technical nature of the job, most employers require a surveyor to have a bachelor’s degree in surveying, mapping, or geomatics. Licensing requirements differ from one state to another. Some states require only a high school diploma while others expect a college degree. However, all states require taking and passing the Fundamentals of Surveying Exam given by the National Council of Examiners for Engineering and Surveying (NCEES) where these requirements can be found in detail. Certification as a land surveyor is optional and can be attained through the National Society of Professional Surveyors (NSPS). Certification can allow a surveyor to attain a specialty status. There are approximately 25 universities that offer a bachelor’s degree in surveying. There are many two-year college programs and also programs through vocational and technical schools. Typically, four years of experience working as a chainman under a licensed surveyor is required before taking one of these exams. According to the U.S. Bureau of Labor Statistics, there are approximately 44,800 practicing surveyors. The median annual wage for a surveyor in 2017 was $61,140. The median income is the level at which half of surveyors earned more than that amount and half earned less. Level of experience and specialty certifications will affect how much a surveyor earns. Location is also important with those working in the Northeast and Northwest having a higher salary than a surveyor in other parts of the country. This area is expected to show an 11% job growth from 2016 to 2026, which is slightly above average. An applicant must provide a summary of any conviction in detail so that the state board can determine if it relates to the practice of professional surveying. If the board determines the conviction is related to the profession of surveying, an applicant must provide details of the conviction to determine the effect on eligibility for registration. Helping themselves be successful in their pursuit of becoming a surveyor requires felons to be honest about their background. There are re-entry programs, such as drug treatment, and educational opportunities for felons who need them. For many felons, having their felony expunged can give them the chance they need to begin with a clear record and succeed in becoming a surveyor. It’s a significant challenge, but it might be worth it for a felon that wants to become a surveyor. Having his or her record expunged and also documenting any training programs or additional education could make the essential difference in a felon succeeding. What do you think about this blog post? Have you or someone you know been in the situation of trying to become a surveyor with a felony? What was that like for him or her, and how did he or she achieve success? Please tell us in the comments below.